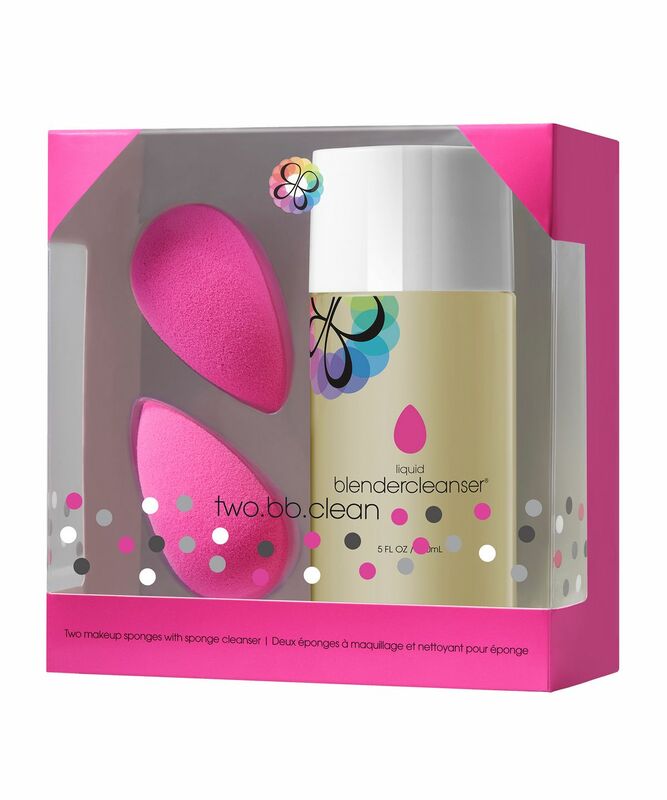 The perfect gift for any make up maven, Two.BB.Clean unites two Beautyblender sponges with a bottle of the Liquid Blendercleanser in a cute magenta gift box. Multi-award-winning, no cosmetic collection is complete without at least one of these distinctive pink sponges – the secret to a seamless, photo-ready finish. With 360 degrees of edgeless perfection and an innovative open cell structure that retains moisture to help minimise make up absorption (so you waste a lot less product), Beautyblender permits optimal dispersion of base, concealer, blush or bronzer, to achieve a flawless ‘soft focus’ effect. Beloved for its innovative elliptical shape, the Beautyblender sponge hugs facial contours to blend crème and powder formulas, while Blendercleanser keeps your applicators clean and sterile (it’s brilliant for brushes too!). Beautyblender is easy to use: simply wet, squeeze and bounce your way to make up perfection! Apply an ample amount of liquid blendercleanser to the sponge. Squeeze and compress gently, working into a lather. Pressing the sponge releases oxygen allowing liquid blendercleanser to be absorbed. To avoid splits, snags, rips or tears squeeze delicately, avoiding twisting or pinching. For stubborn stains, pour a small amount of liquid blendercleanser into a bowl with water and let your beautyblender soak for a few hours or overnight. Rinse with clean water. Squeeze away excess water with a towel, set out to dry completely in a clean, well-ventilated area and re-use. Water (Aqua), Potassium Palm Kernelate, Potassium Oleate, Glycerin, Potassium Cocoate, Potassium Citrate, Maris Salts, Lavandula Angustifolia (Lavender) Oil, Citric Acid. I love my Beuty Blender!The Beuty Blender Cleanser isn’t amazing! Highly recommended! I love Beauty Blenders and I love the cleanser. It is one of my FAVORITE cleansers. This is probably my 4th bottle. No cleanser does the job as much as this one does. I bought this pack because the price worked out the same as buying two beauty blenders with a free BB sponge cleanser! I previously used the BB soap and I gotta say this cleanser is way easier and a lot less messier to use. I am now set for next few months and look forward to buying this again. I absolutely love Beauty Blenders and I genuinely think they are much better than any other beauty sponge brand. The Beauty Blender Cleanser is nice and has a fresh scent. Beauty blenders are great as always, the cleanser isn't amazing. Still a decent purchase but will be looking for a different brush cleanser. First I ordered single beauty blender. It was amazing. So I ordered this 2 beauty blenders with cleanser set. The cleanser is also good, but beauty blender is amazing. Can not think to apply foundation without this pink beauty weapon. My foundation looks flawless and last longer with this. Feel that using the Blendercleanser helps the Blenders last longer. This set is definitely a great value. I use the Blendercleanser for my makeup brushes too. I love my Beautyblender Pro so got this set to have an extra Beautyblender at home, and this set is fantastic value for money - you're essentially getting 1 of the 3 products for free! The Beautyblenders speak for themselves, but the cleanser is brilliant - with it's gentle formula, it's fantastic at cleaning both Beautyblenders and other makeup brushes too. Highly recommended! Can't fault the Beautyblender sponge! The cleanser could be in dispenser so you can control how much comes out of the spout. But the solution cleans the sponge really well. The blenders are amazing. The only downside is the liquid which does not clean the stains on the blender. It's amazing, definitely deserves all the great reviews. Good value for money. Love them and would definitely purchase them again. Good value! Love them! Definitely would buy again. The Beautyblender is such a great product, but shout out to the liquid cleanser. It works just as well as the solid cleanser and gets all the gunk out. Not sure what is the cost per use for the cleanser but I'm constantly surprised by the products put out by this company.